The capital of New Jersey is Trenton. New Jersey is bordered on the north and northeast by New York, on the east by the Atlantic Ocean, on the south by Delaware, and on the west by Pennsylvania. 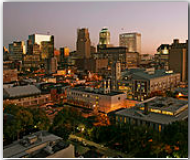 As of the 2000 census, the population of New Jersey is 8,414,350. New Jersey is the most densely populated state in the nation as well as the wealthiest state in the nation with a median income of 55,146 dollars a year, according to the 2000 census. Major cities include: Newark, Hackensack, Hoboken, Elizabeth, Jersey City, Paterson, Vineland, Atlantic City, Cape May, Camden, Princeton, New Brunswick and Trenton.